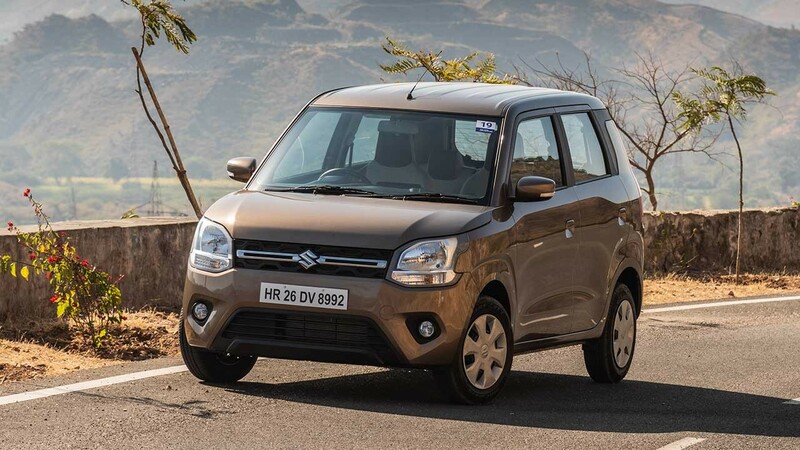 If you think of hatchbacks, you tend to think of Maruti Suzuki and along with that name pops up the familiar Wagon R. This is a hatchback that now ranks as one of the oldest brand names around. Moreover, while its peers have been merged with other brands or moved on to different body styles, the Wagon R holds firm ground. It takes a single glance to tell a Wagon R apart and over nearly two decades, the design has remained largely unaltered. With the brand-new third generation Wagon R, the designers at Suzuki have tried and kept the key ingredients that made this car so distinctive and thrown in a bit of flair. There is no denying that fact that the third-generation car is bigger, in every respect, and it has received styling cues that emphasise this fact. It gets big headlamps, a bigger grille and a large airdam to make the front appear wider and larger. While the side profile retains the same basic lines, the car is longer and it gets a prominent niche that runs the length of the car. Square-ish indentation over the wheel arches are linked by a low crease along the doors to break up the mass nicely. There’s also the a partly blacked-out element in the C-pillar to make the mask its height. At the rear, there’s plenty going on between the sculpted surfaces, massive chrome element and the tall taillamp design to keep the eye busy too. Like the newer Suzuki cars, there isn’t any mention of the trim level on the exterior of the car. There’s plenty to look forward to in the cabin as well. A brand new dashboard is immediately noticeable. 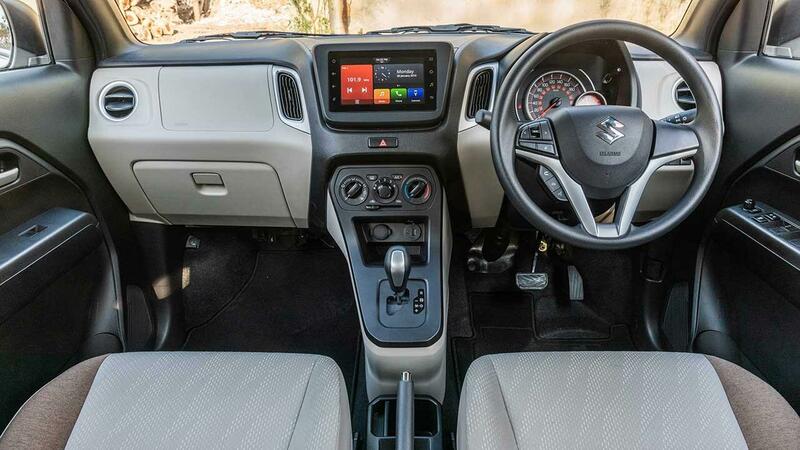 The two-tone dash with brushed metal-finish inserts looks good as does the touchscreen infotainment system with its new interface as well. The steering wheel gets control for the infotainment system and your connected device as well. A large instrument cluster sits behind the steering with an integrated smaller pod that displays the rev counter and selected gear. True to Wagon R practicality, there are bins and storage areas all around the cabin with a hidden away storage tray under the passenger seat as well. In case you like to carry a cup of tea/ coffee with you, don’t worry, these vents can be shut as well. If you thought this was the big change, well, you’ll be in for a surprise when you take a seat in the second row. The longer wheelbase and tall design has freed up an incredible amount of legroom and can easily fit six-footers. You get a deep luggage well, which is quite broad as well and can accommodate enough cargo to embarrass some larger hatchbacks. Add to that the 60:40 split in the second row and you are all set. Suzuki has debuted the third-gen Wagon R with two-engine options – the 1-litre and the 1.2-litre with options for automated and manual gearboxes. I had a chance to sample both gearboxes combined with the 1.2-litre petrol motor. 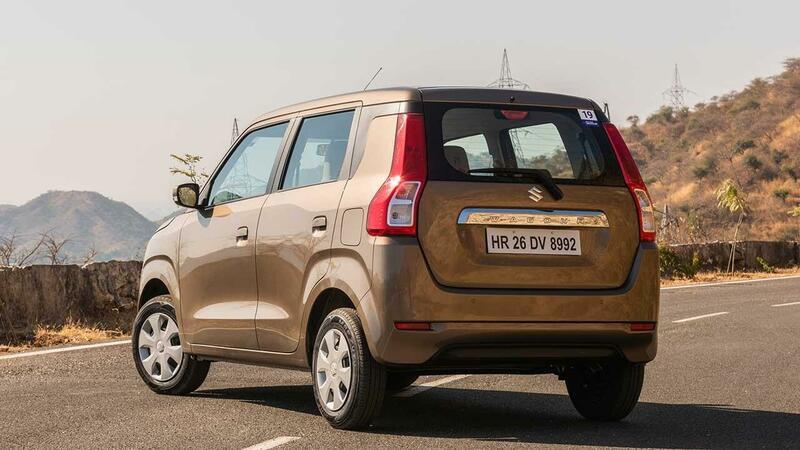 Tuned to deliver 82bhp and 113Nm of torque, identical to the Swift, this engine delivers smooth performance. 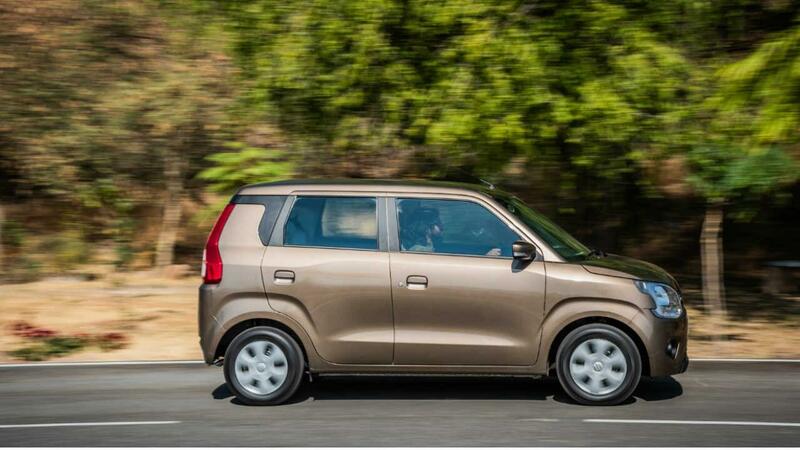 With a slight weight advantage, the Wagon R gets off the line well and proves agile around town. Mated to a five-speed manual gearbox, delivery of power is linear right up to the 6000 revs redline. You can also choose to roll along at around 20-kph in third gear and expect the car to pull along gradually to pick up pace. Noise levels are acceptable inside the cabin, but transmission whine is pronounced when you get off the throttle. There isn’t much to write home about the steering either, apart from the fact that you can point the car in the general direction that you would like to proceed. The automated ‘box adds a great deal of convenience without robbing you of efficiency and for a 47k option, this is a must have for all urban users. It isn’t the best companion if you enjoy driving, go out of town, or live in the hills, but as far as stop-go congestion is concerned, it is a massive boon. There were broken stretched in the city of Udaipur, thanks to infrastructure work and speed breakers of various shapes and sizes to impede progress. This put the Wagon R to a proper test and it dealt with all of it without getting unsettled. It does not smother bumps or potholes, but it manages them and with the stiffer ‘heartect’ platform, there isn’t a springy feel either. The Wagon R, even in its third generation is an urban focused car, and this it does well. The tall design makes for a fair bit of roll, but given the choice between the space the design creates, you shouldn’t mind sacrificing some dynamic ability. An option for fatter tyres and optional alloys may improve things, but that is likely to be an accessory that you need to choose later on. While the interiors and the space available are big highlights of the new Wagon R, the exterior design manages to complement it with lines that make it appear less boxy. There are plenty of features available, but the quality of finish isn’t quite what we expected. The bonnet shut-line leaves a wide gap, there seem to be blotches of excess paint in the corners, the wheel-wells don’t get any cladding. On the inside the second-row split seat does not line up perfectly and you get a tiny hole in the carpet in the boot to lift it up for access to the spare wheel. Moreover, you need to slam the front doors to get them to shut properly. Hopefully, the cars on the showroom floor will have these little niggles sorted, because at 5.36 lakh and 5.69 lakh (ex-showroom, Delhi) for the manual and AGS options seen here, the new Wagon R delivers an impressive amount of space and features to match it.